Social networking sites are abuzz with news about Muslims being killed in Burma.You can see the sporadic posting of pictures by different people with captions like ‘Muslims killing in Burma’, ‘Muslims slaughtered by Buddhists in Burma’ and so on. Thus, I took on the mission to sort the truth out for myself once and for all and researched some pictures that I felt were dubious. Below are a few pictures and their original copies. You can evidently see the gross difference between them and how they are thrown out of context. This was a picture shared on Facebook. I have found the original version which reads differently to the the one posted on the social networking site. This picture was taken in 2010 after an earthquake in China and captures the efforts put in by the Tibetans to help rescue the victims. Now, Islamic political parties and some other elements are sharing this image as Muslim killing and their slaughter in Burma. Another widely circulated picture captioned “More then 1,000 people killed in Burma” is also fake. The original, as you can see below, is taken in Thailand in the year 2004. This picture shows protesters that were tear-gassed outside the Tal Bai police station in Bangkok. This is roughly 1,409.9 km away from Burma! What is grossly negligent about these photos is the factual ignorance of the hate these misleading photos can culminate. Below, please find another image which was posted online, this time with an imprint of Jamaat-e-Islami on the top left . It reads ‘Terrorists of Budhism of Burma kills 500 Muslims’. As you can guess, this is also a fabricated picture. In reality, this image belongs to a Human Rights violation incident by the Thai authorities against the Rohingya ethnic minority of Burma. These refugees were detained for a few weeks and then sent off drifting into the sea. Here is another instance of such fallacy spreading across the social media sites regarding the massacre of Muslims in Burma. This picture is extremely misleading considering that the original image was about the riots in Thailand that took place in 2003! Now, take a look at the image below and observe how it is blown out of context. The original picture is not even remotely close to what the picture above states. In fact, a Tibetan protester had set himself on fire in protest prior to the arrival of Chinese president Hu Jintao and that too in Delhi. I do not deny the killings of Muslims in Burma – not even for a minute. I think it is horrific and I am sympathetic towards the immense loss being suffered by my Muslim brothers and sisters abroad. What I am against is being lied to. Imagine the amount of lies we are being fed through these pictures. How can one trust any image online if such drastic manipulation and editing is being done to cater to someone’s political or personal agenda? Social media and networking sites, if used properly, can be an impressive tool in spreading awareness amongst its users, but it can be an equally dangerous median as well if misused. These images are false and are only igniting hatred and prejudice in our youth. We need to become more vigilant and aware of the credibility and authenticity of pictures we browse through. It only takes one wrong image to push us over the edge towards extremism. Who do you think is more misleading? Corrects yourselves people… The picture mentioned to get your attention could be wrong but the ethnic cleansing of Muslims in Burma is a reality… Don’t just close your eyes ppl. Go to these links and see by yourselves. How about this one author? I do not deny the killings of Muslims in Burma – not even for a minute. I think it is horrific and I am sympathetic towards the immense loss being suffered by my Muslim brothers and sisters abroad. LOL at the research !!! Well your research is based on Internet as well.. thank you for putting the pictures here.. indeed the pictures are misleading but the fact that Muslims are slaughtered in Burma can’t be ignored as well. how about i share with you a video link ? yes they don’t show human pieces as our own media but you can clearly listen to what the reporter is saying in the video..
Making these pictures fake doesn’t mean that Muslims are not being killed in Burma. These pictures can be fake, but massacre of Muslims in Burma particularly Rohingya people is true. Here are some links from Wikipedia and Youtube that shows the truth and which also inform us that according to UN Muslims in Burma are considered as one of the most persecuted minorities in the world. On a related note, you don’t see Pakistani media talking about Uighur Muslims the same way, do you. Why? Because the oppressors are the sugar daddy of Pakistan- China. Its funny to see how these liberal writers will always challenge information that makes Muslims look like the oppressed, but will always promote information that makes Muslims look like oppressors. There might be misleading pictures that you have exposed, but how do you explain the thousands of Burmese Muslims that fled to Bangladesh to save themselves? How do you explain the videos of live interviews of these Burmese Muslims in which they describe their terrible conditions? Great research and its good to know k reality kya hai … I wonder why does it always have to gain sympathy of being a MUSLIM ….. i mean being MUSLIM doesnt mean we start making such stupid situations…. After seeing those links earlier i also tried to find what exactly was happening in BURMA but could nt find much … infact i did see an Article in the same Express blog which was on this entire issue but from the falsified angle…. media will never give u the whole truth, may it be electronic media or social media. It slowly and gradually changes public thinking according to its own objectives and this process is sooo slow that one never realizes it. Presently, it is working against Muslims throughout the world. You can only realize this change once u look back about 15 years time, e.g. in 1997, wat was your opinion about Muslims, Fundamentalism, Extremism, or any other concept of Islam like “Parda” etc. Keep on increasing the time span and find more and more change in your thinking. Author writes “I do not deny the killings of Muslims in Burma – not even for a minute.” but at the same time, successfully misleads the readers to believe that there is a fake hoax going around in social media about the muslim killings in Burma. @faizaan: In Punjabi we say ‘kanaa nu hath launa’! If any one has spread such a morphed photo then Allah ka azaab us pe aur uski aani waali nasl pe! Muslim Ummah have to care about what ever your sharing must be authentic, Because Fitna is Haram in Islam. The Day is near when no one will trust Muslims. And if anyone here is misleading anyone, it’s you Mr. Faraz Ahmed. Please be sure about what you’re doing. Please delete this false article. The pictures are fake, i will give you that. But don’t think for a moment that nothing is happening in Burma. 9/11 was a false attack, and has led to the killings ONLY of Muslims. Only a fool will disagree. Iraq, Afghanistan, Syria, Egypt, Pakistan… and soon Iran. The world is STILL about GOOD v EVIL, GOD v DEVIL. You may read the following books to know more about the Rohingya Muslim problem from a Muslim perspective. how can he lie when posting original pictures with proofs. why u ppl are so dumb? how can anyone hide killings on such great level? It will always be about the battle between good and evil… What makes you think you are the Good side? Nobody’s denying the Rohingya situation and the persecution of Muslims. But the social media clowns exaggerated the matter to the level of the genocide to get enough Facebook likes and shares. The Burma genocide is recognise by the UN & the UN says the Rohingya Muslims are one of he most oppressed in the world. This Blog is a reverse blog which is trying to Prove otherwise.Shamefula ct by the blogger who is doing what US is doing to to push their interests in Burma. 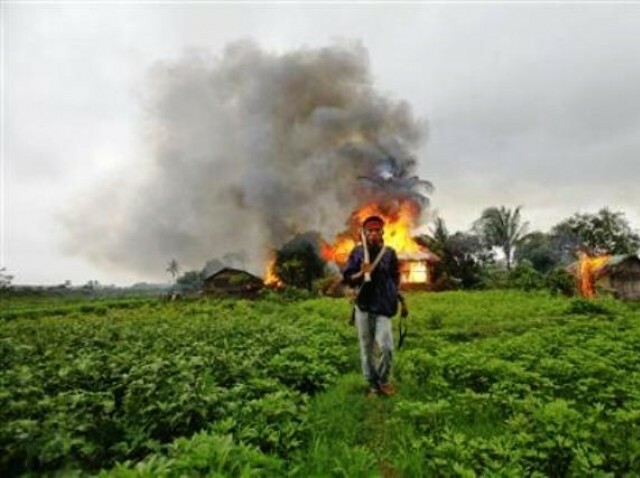 see Guardians articles : Ethnic violence mars transition to democracy for Rohingya in Burma & Burma ‘creating humanitarian crisis’ with displacement camps in Arakan , even New York times, and many others have began to break the criminal silence! Let me tell you whats happening there – ‘Ethnic Cleansing’ is what they are doing, killing Muslims indiscriminately just because they are Muslims, burning people, throwing infants on swords and its all state sponsored. The president of Burma, Thein Sein has said that these people do not belong to Burma and the UN should take them as refugees – the UN has refused. Some tried to escape to Bangladesh to avert senseless killing but Bangladesh refused to take them in and sent them back. According to independent research, these people are the most persecuted on the planet and also the most destitute. They literally have nowhere to go. The reason nobody has pictures is because the media is not allowed in but the bodies are washing up on the shores of Bangladesh. If there were, they would also be of mass dead bodies and people burning and infants on swords e.t.c.I have posted some videos below from reputed news channels on the plight of these people. Why is it that the Muslim ummah has become so heartless? Wasn’t it said that Muslims are like one body, if the hand pains the whole body feels the pain. Why is it that we are more concerned if the pictures are fake or real than with the plight of these Muslims that no one wants to accept? I request you Mr. Faraz that instead of wasting your energies on finding if the photos are fake or real and undermining the plight of these people by posting about fake pictures, please raise your voice to the media, Muslim leaders, UN and super powers of the world which are all criminally quiet. @Haseeb Jawed I think that u r not justifying with the truth. Author is not saying that killings are not happen, he is saying that the propaganda has raised through Pictorials are false and fake. And i think who is using this issue for politics may be Jamat e Islami or other forces who want to be alive in media or social media by spreading these kinds of images. To all those people bashing the author for “denying” the massacre in Burma: please read the article again.